Ask and you shall receive! I finally have pictures from Eggroll’s nursery to shall with y’all. As a reminder, here is what I was using as inspiration to design the room. 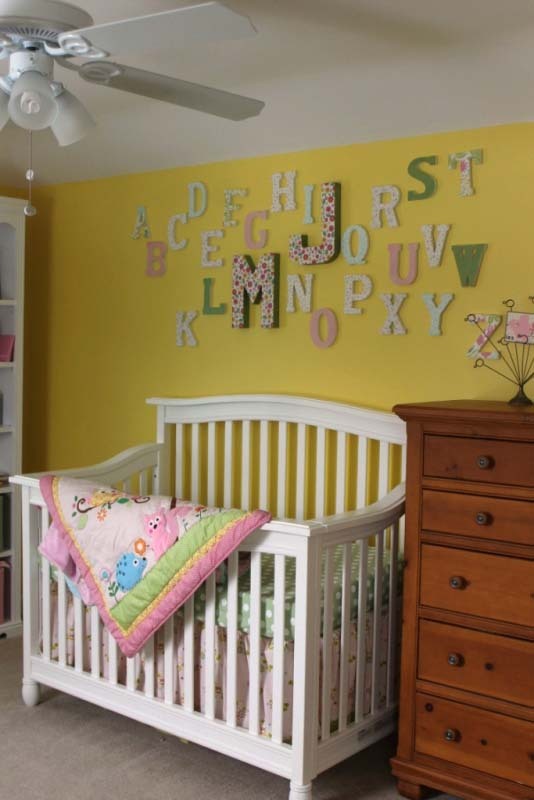 We used the baby comforter shown there and below to help pick colors and other accent decor. I’m so happy with how the letter wall turned out! I used wooden pieces for the small letters and cardboard designs for Eggroll’s initials. I purchased all of them and a pack of bright, flowery scrapbook paper at Joann during a sale. Then I simply traced the letters, cut them out and used Modge Podge to adhere the paper to the letters. If you were able to look really close, you’d see it’s not perfect, but I think it looks great. The initials are the only ones that were big enough for me to take the time to do the sides, too. The smaller letters were already white when I purchased them. Score! We are SO lucky to have friends that are willing to share their skills AND their old stuff. 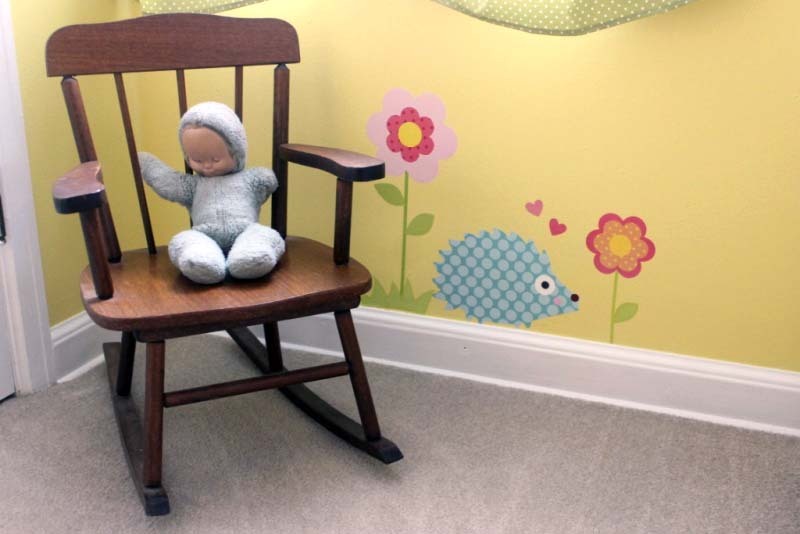 This glider came to us from my sister-in-law, but after four kids, the cushions were shot. Another friend made new cushions for the rocker AND found the ottoman on Craigslist for us, too. Randy painted this side table white to cover up years of wear and tear. The big trunk you see was a college graduation present from my dad. He spent so much time worrying about the hinges, ensuring they don’t close on little fingers. I guess we’ll see soon if it works! Also, the piece of wood you see in front of the vent is a chip carving he made using my favorite quote. I thought that was a good one to have in Eggroll live by, too. 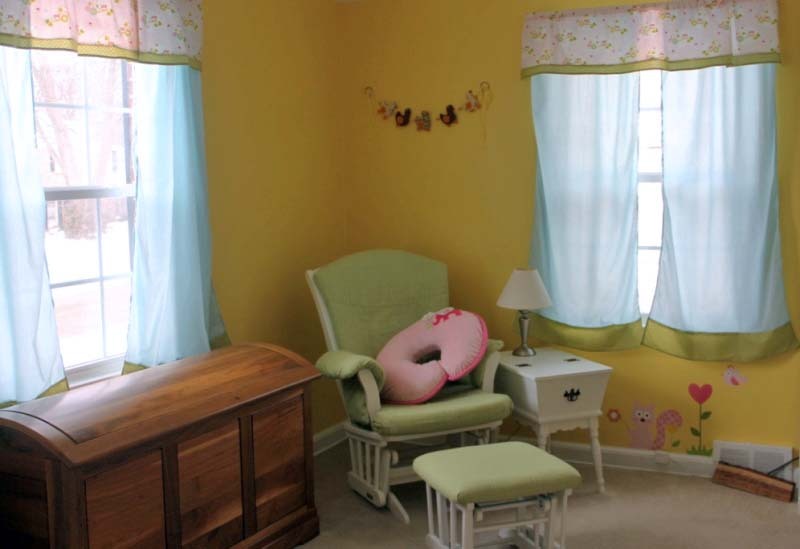 I made curtains for this room using the sweetest fabric from Joann. 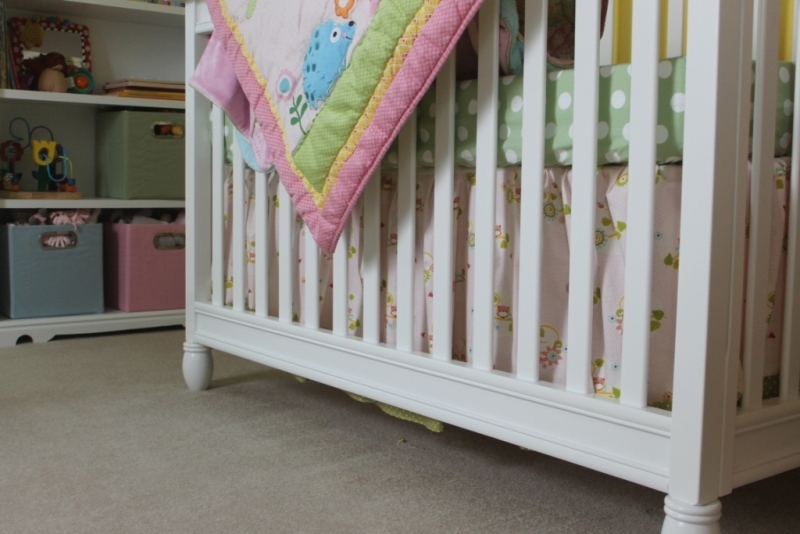 I only had four yards for the curtains and the crib skirt, so I wasn’t able to make these pieces too fluffy. I think that’s OK.
Each window in this room is a different size, so I had to figure out an equation that kept them looking the same. In the end, I went with 1.5 times the width of the window for the valance fabric and TWO panels of 3/4 times the width for the main, blue curtains. 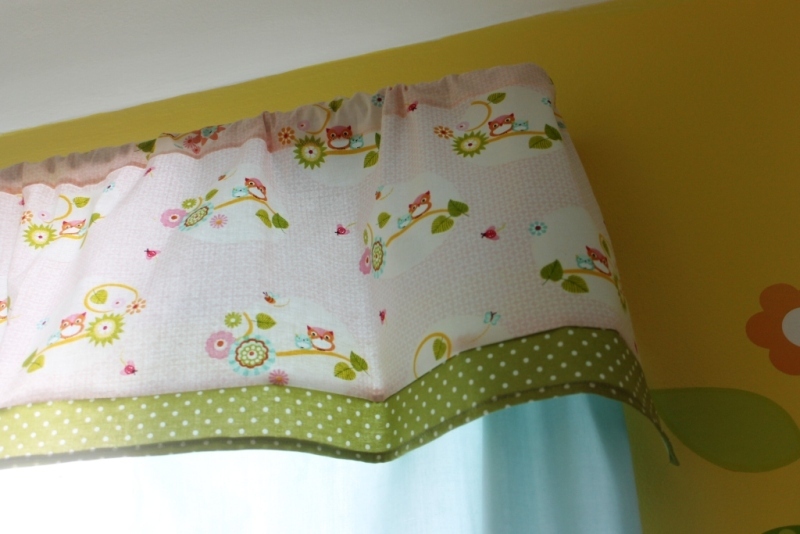 I measured the valances to be roughly 13 inches long all told (2 inches of green and white polka dot fabric, 12 inches of pink owl fabric… Allowing for hems…) and the long curtains to be 61″, which was just an inch or two beyond the bottom of the window frame. We used a double-hanging curtain rod since you can’t see them at all. Also, I used a basic muslin fabric for the long blue curtain since I knew I would need so much. For all three windows (32″, 45″, and 39″), I used 10 yards of 45″ wide fabric (with a lot of leftovers…what to do next?!?) That was much more manageable at $3.50/yard vs. the alternative! To create the bed skirt, I did almost the same thing as the valance, using 1.5 times the width on the three exposed sides to create the actual skirt. I followed this tutorial, but instead of using the sewing machine to baste, I just did that by hand. I think it was much easier. CAUTION – Check, double check, and then check again before you sew the skirt to the piece of fabric that goes under the mattress. I accidentally sewed one side on backwards. Fortunately, this is not an exact science, so I had enough fabric left to cut and resew, but if you look close, (and underneath the mattress…) it looks silly. This is the children’s desk we found on the side of the road. 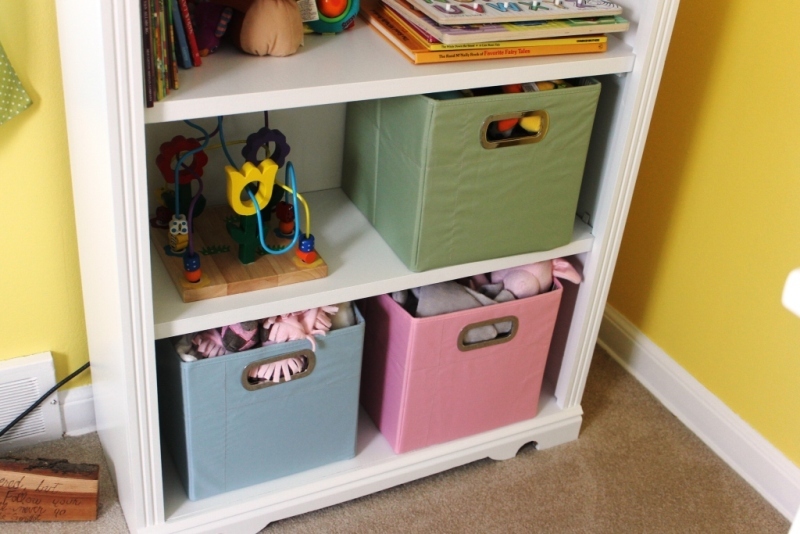 It was already white, but Randy repainted it and fixed a couple of the drawers to make it new baby appropriate. 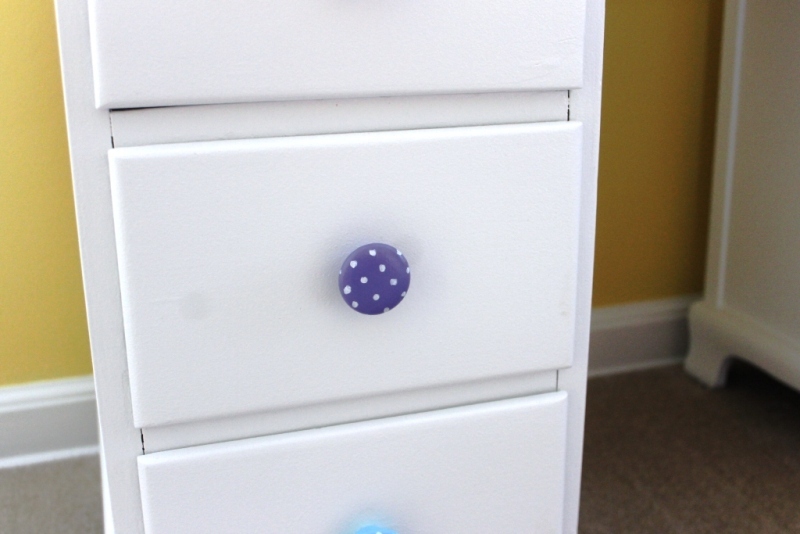 The drawer pulls were already painted in all the different colors, but I used a white paint pen to add polka dots because…why not? When we were registering for things on Amazon, I fell in love with the set of wall vinyls . I’ve wanted a tree on the wall since I tried painting it post-break-up with another boyfriend way back when and this was the perfect accent for the comforter! The stickers went up easy peasy. The set included a “stick by numbers” set of directions, but I did some artistic direction on my own. The tree would have been pretty low had we had the trunk go all the way to the ground, so we decided to hide it behind the changing table and put the other ground items around the room. Oh, and this picture also showcases my doll, B, that slept with me from my first Christmas until I went off to college. Randy thinks she’s full of cooties (probably true), but I’ll probably panic over having to share before I let Eggroll play with her anyway. 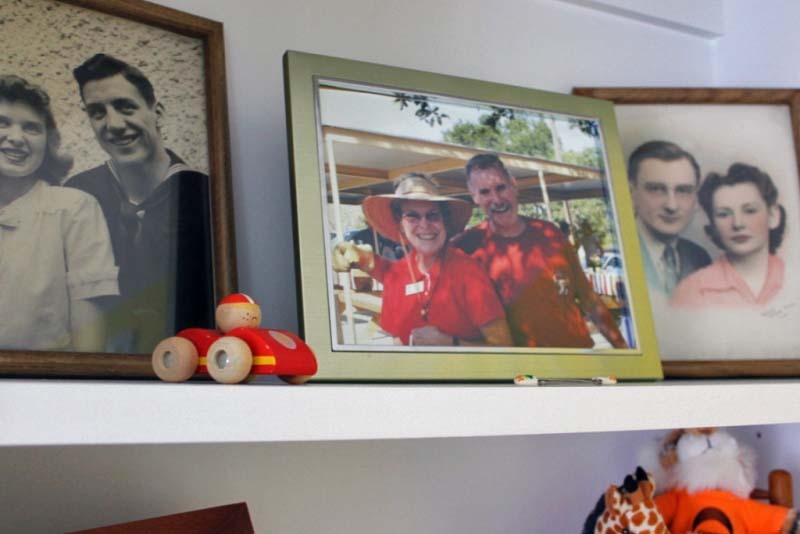 Speaking of good memories, I used up a shelf on the room’s bookcase to display pictures of family members that Eggroll won’t get a chance to meet. I know (hope) we are a long way off from the “what happens when you die” conversations, but I want Eggroll to know she comes from long lines of awesome people on both sides. I’m so proud of this room! It was a ton of work, but the little lady will be able to look back at pictures and see how much we loved her before she was even on the scene! 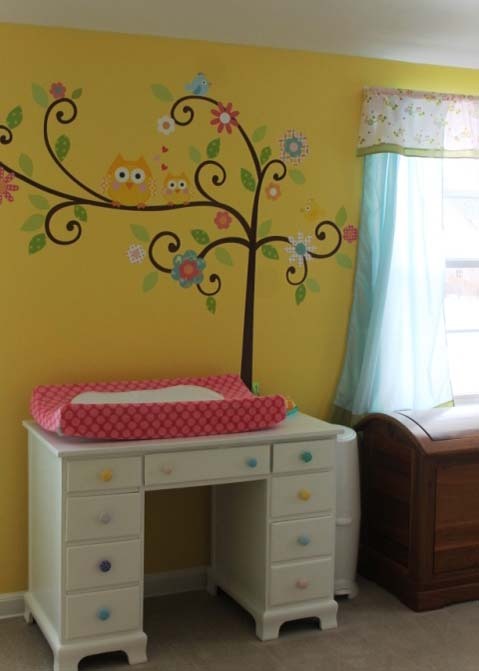 Malorie’s room is just as adorable as she is! I love the mix of colors, fabrics, and old and new furniture! It just turned out so warm and inviting! You two have a real talent for coordinating everything! Hugs!